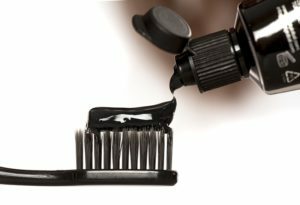 Charcoal has become a popular ingredient in dental care products. Many companies claim that charcoal can aid in cleaning and whitening teeth naturally. Is it safe to use charcoal on your teeth? Is charcoal too abrasive to use on your teeth? You have to understand what charcoal is to answer those important questions. Charcoal has been used for centuries for many different issues. Charcoal is a milled fine powder that is made from coal, coconut husks, olive pits, or bone char. Charcoal produced through a process that delivers high heat to the raw materials that activate the powder. The high level of heat allows the charcoal to change its overall structure and makes it less abrasive and more porous than traditional charcoal. The way in which charcoal is processed also allows the charcoal to be sanitized and remove any harmful substances. Charcoal’s overall composition allows it to be an extremely useful product for many different problems. Due to its porous texture, charcoal is able to trap substances that are unwanted. Charcoal is often used by hospitals in situations that involve ingestion of poison or overdose to absorb the dangerous substances. The human body is not able to absorb charcoal, and this allows the toxins to be removed along with the charcoal when it is excreted. Currently, there is no clinical research that supports the claim that charcoal is able to whiten teeth. The Food and Drug Administration (FDA) has approved charcoal for use in oral care products. There is some evidence that charcoal able to absorb plaque as well as other elements that may stain the teeth. The chemical properties of charcoal allow for it to bind to substances that stain the teeth, which in turn whitens them. Keep in mind that you should research any charcoal teeth whitening products that you use. A cosmetic dentist in Langhorne may be able to advise you on which products are safe to use on your teeth. You should ensure that you are not using a charcoal product that is too abrasive. Any product that is abrasive is not advisable to be used on the teeth, as the enamel that may be removed is not able to grow back. You should always consult with your c Langhorne cosmetic dentist prior to using any type of teeth whitening procedure, including charcoal products. Some people have experienced erosion to their teeth due to the use of charcoal products for whitening. It is important to remember that charcoal may whiten your teeth, but it may also harm the outer layer of your teeth as well. If you would like more information regarding teeth whitening products, please contact Langhorne cosmetic dentist, Pearly Whites Dental Care. Call today!